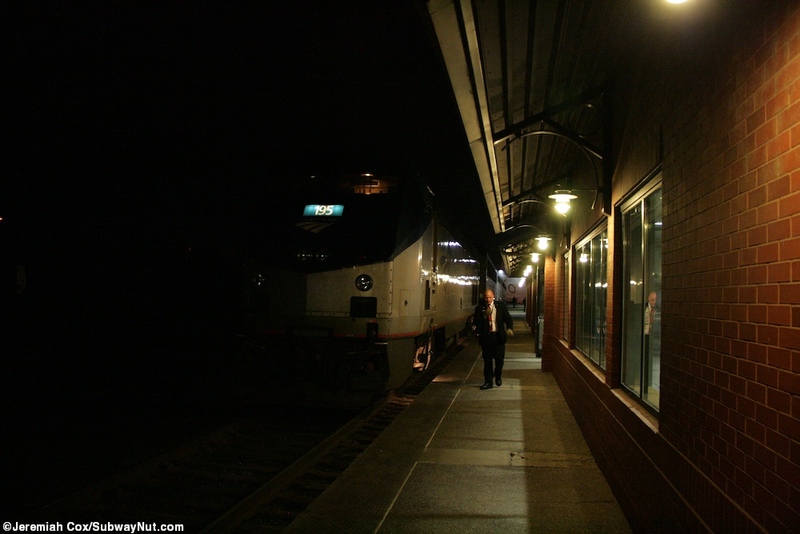 Spokane, WA is the major junction station for the Empire Builder on an embankment/viaduct in downtown. 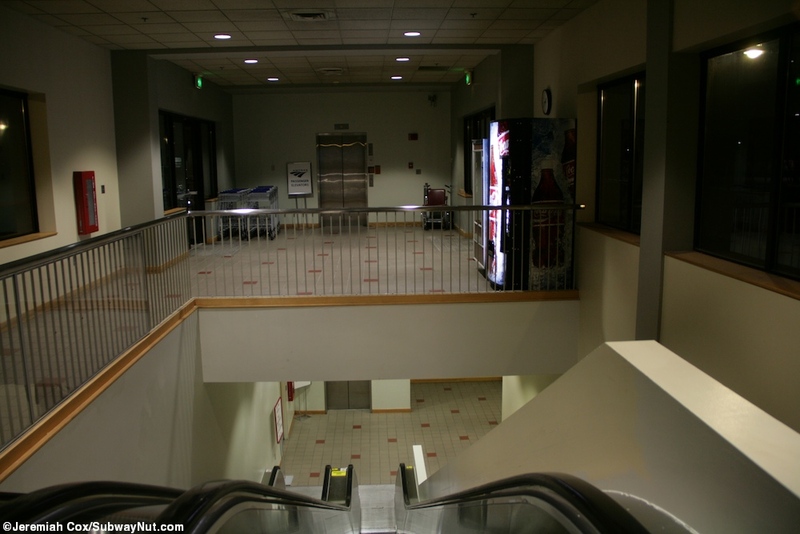 The city of Spokane is the major city of Eastern Washington, and is the second biggest city in the state. 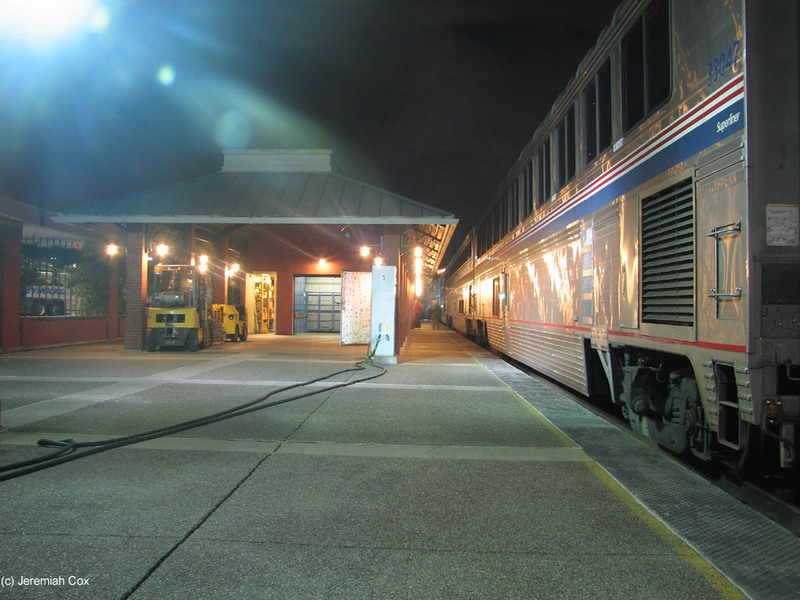 The train station, called the Spokane Intermodal Facility, renovated in 1994, using the existing historic Spokane depot built by the Northern Pacific Railway opening in 1890, is combined with the Greyhound station, and only sees trains in the dead of night and buses during the day. 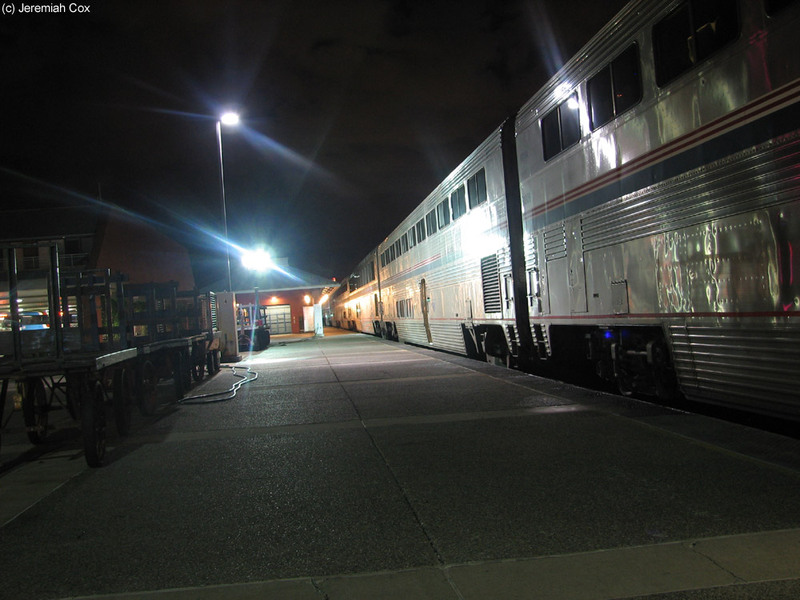 The Amtrak Ticket Office is open from 10pm to 5:30am. 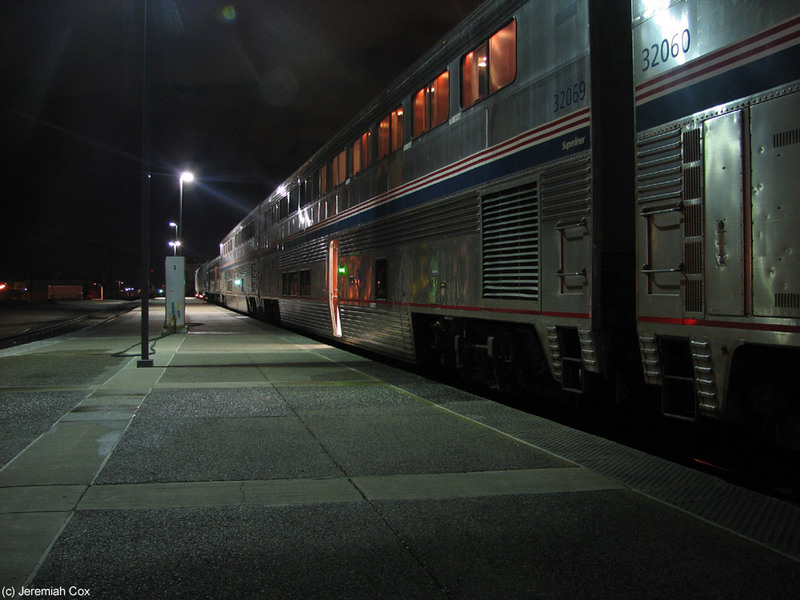 If the train is on time the stop is in use only between Midnight and 3AM, first when the Eastbound Builder (Trains #8 and #28) are brought together, and then just less than an hour later (if on time) when the Westbound Builder (Trains #7 and #27) is divided. 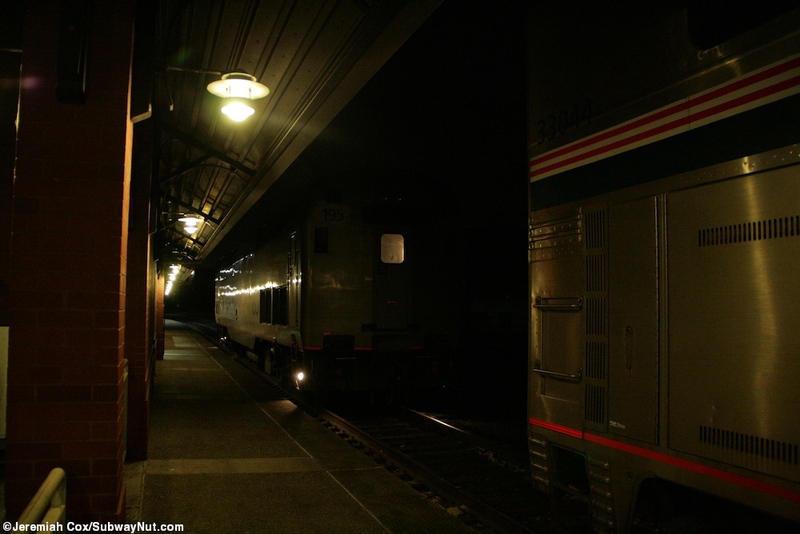 In an ideal world the Portland section would always use two back-to-back P42 Genesis locomotives and there is a siding just beyond the station where these are stored for the few layover hours between the eastbound arrival and westbound departure. 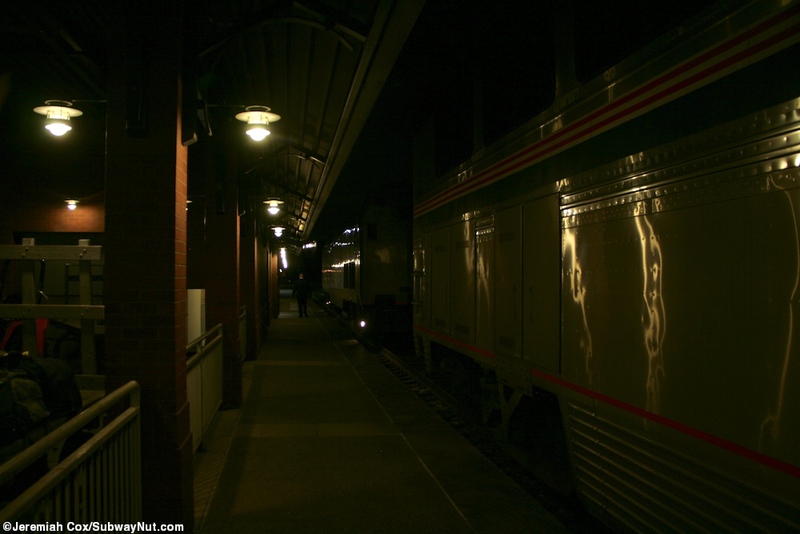 This was the case when I visited the station in 2006. 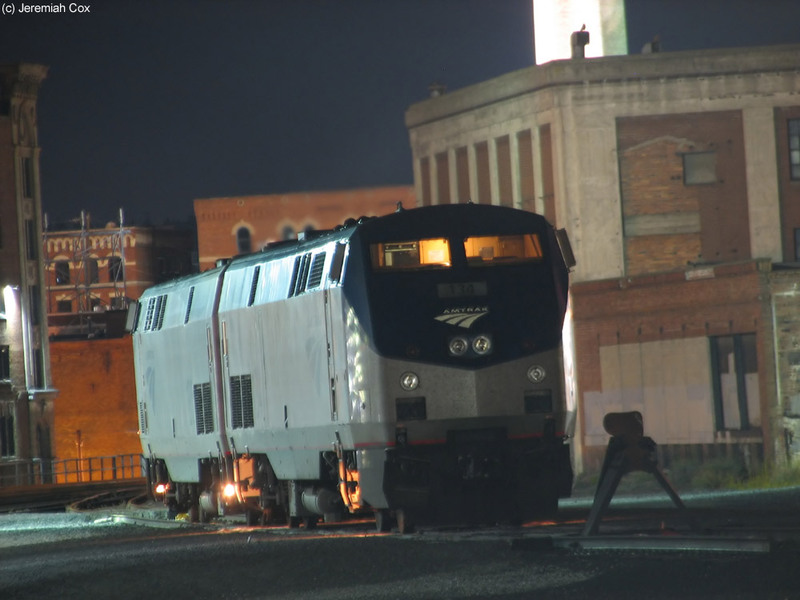 In 2011 more recent locomotive shortages of P42s mean it gets just one Genesis assigned and this results in complicated wyeing around Spokane that can result in delays of the Portland section. 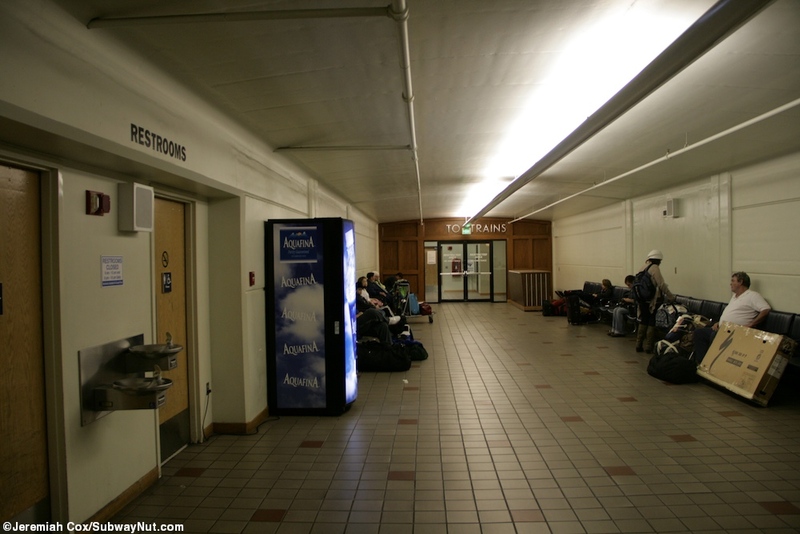 Entering the historic brick station along West 1 Avenue where it curves into Bernard Street, passengers first reach a waiting room with wooden benches. 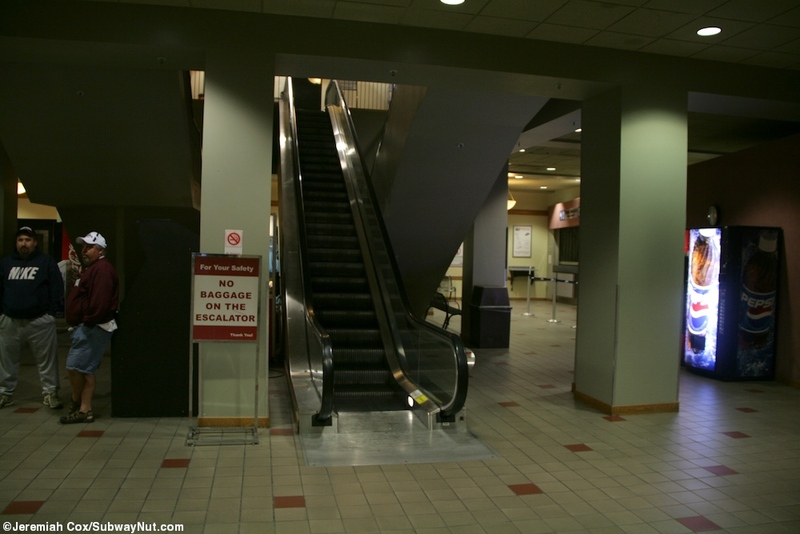 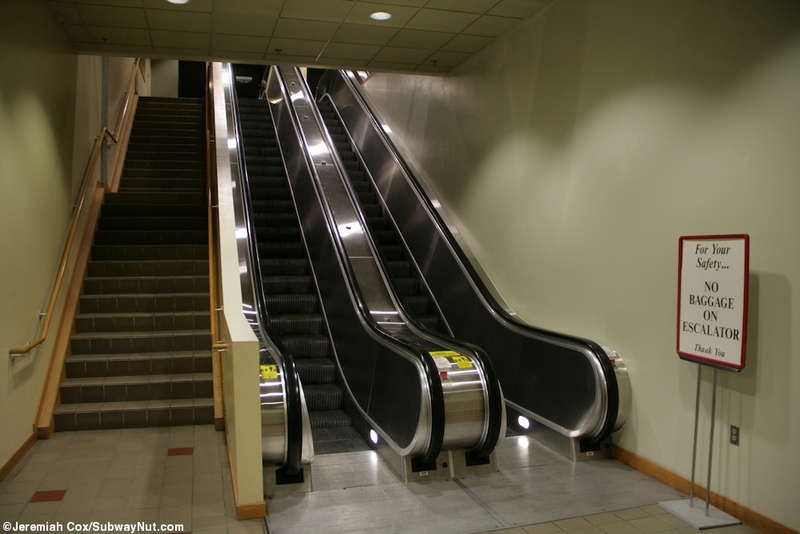 Escalators (and an elevator) go up to a second story and smaller waiting room where the Greyhound bus bays are, on an embankment that probably once housed more train platforms. 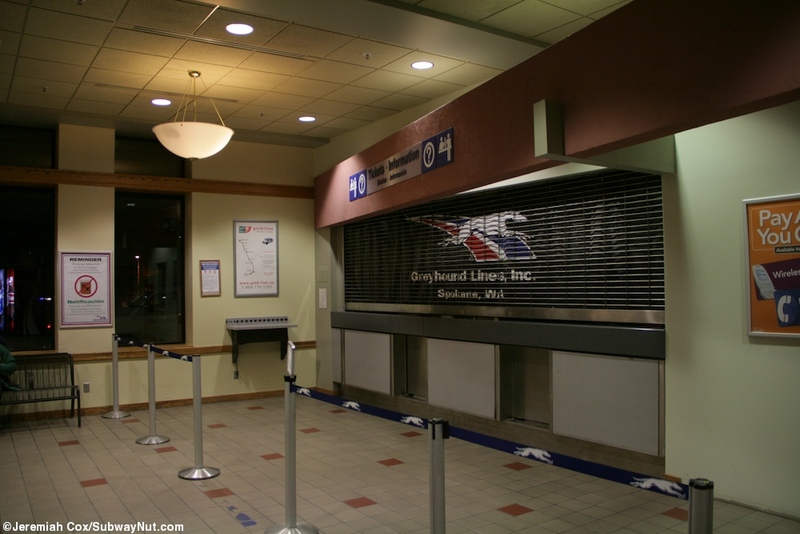 Back on the ground floor is the actual Greyhound ticket window, the large Amtrak office with a small baggage check-in area and then the Amtrak ticket window, followed by the baggage claim and the passageway that leads out to the platforms. 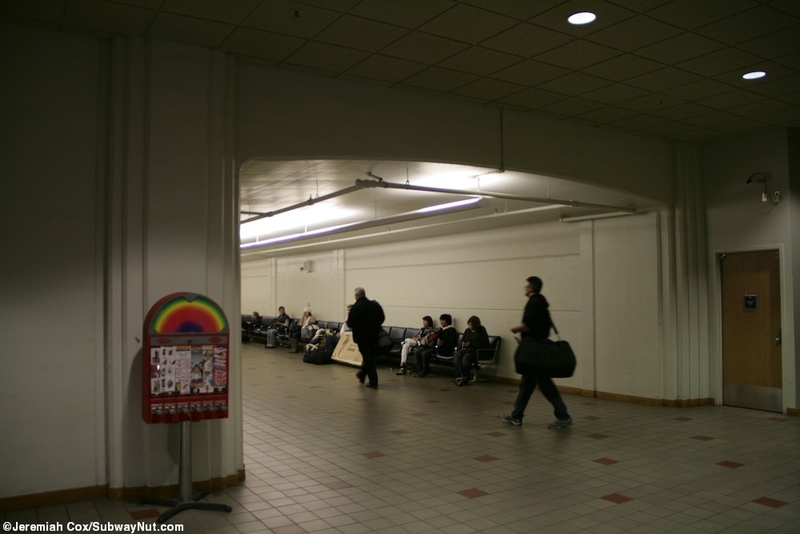 This passageway is lined with more modern benches for Amtrak passengers and ends with doors saying "Restricted Area: No admittance" on them with large silver letters above forming To Trains. 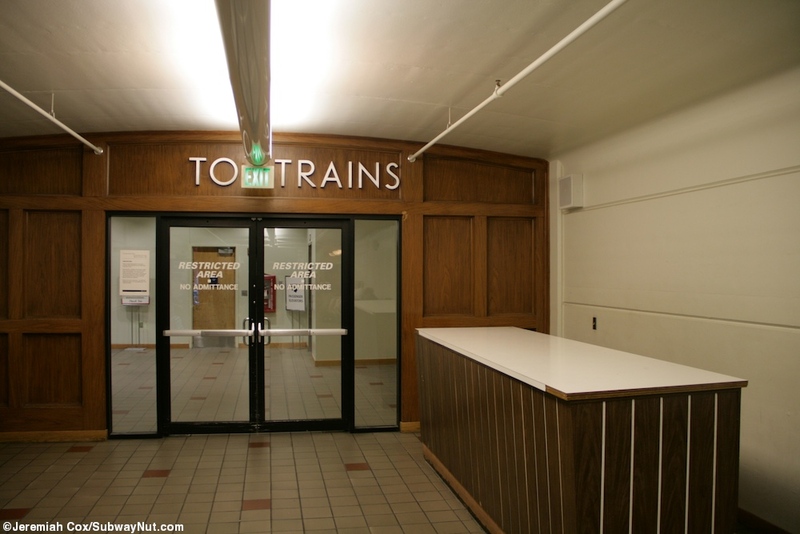 When an Amtrak train is in the station (but a train is not necessarily boarding) these doors are unlocked and lead up to two escalators (one for each direction) and an elevator up to a canopied enclosure along the long island platform with simple lights and tactile warning strips but no other canopies that allows both Empire Boulders to Platform at the same time although not part of standard scheduling. 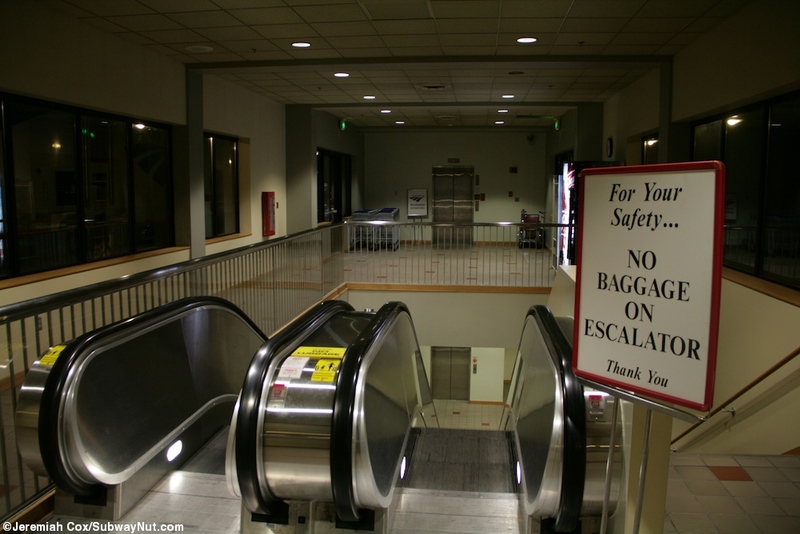 It is a feature though often used when lateness occurs. 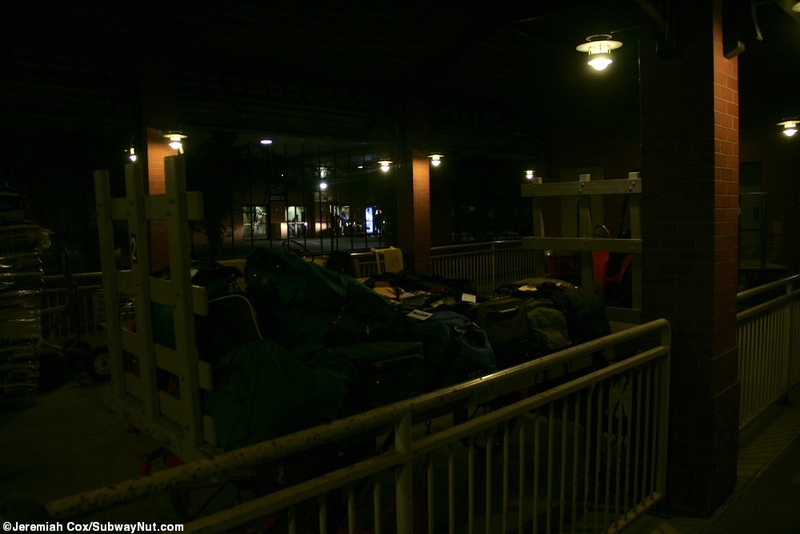 On the back of this canopied entrance is a small sheltered baggage area where baggage carts are left and sorted because westbound (the reverse occurs eastbound) the bags for the Portland section must be removed from Heritage Baggage car that continues all the way to Seattle and put in the Superliner Coach-Baggage car that provides baggage service down to Portland. 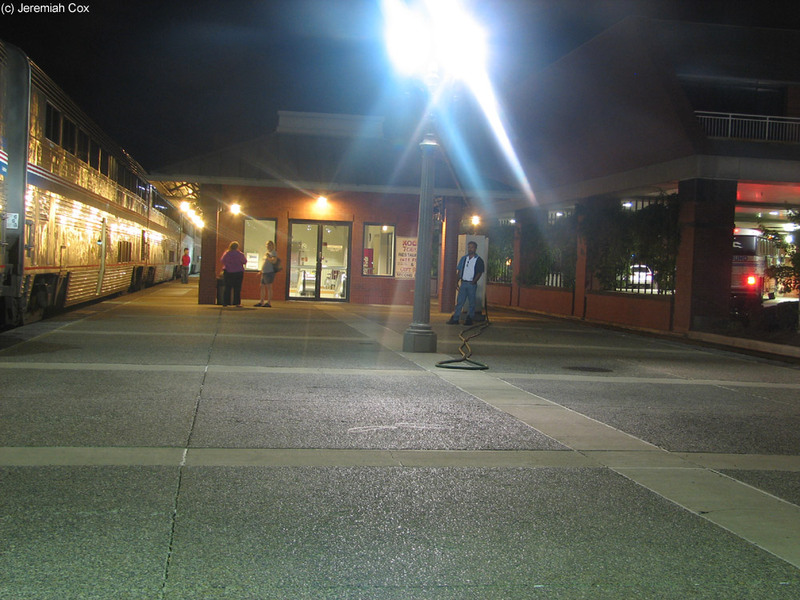 The station platform has absolutely no signs I could find that say Spokane on them. 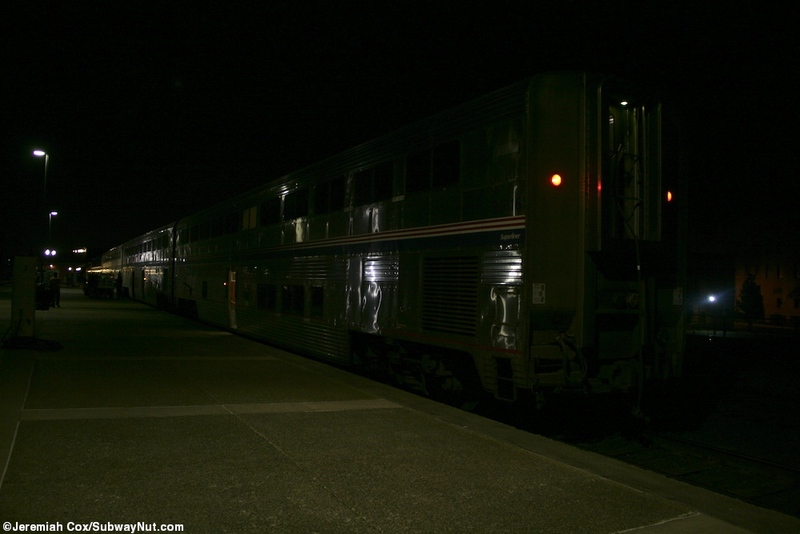 P42 #134, and a partner backed-to-backed sit on their siding just west of the platform after being detached from westbound train #28, to await the arrival of eastbound train #27, so they can pull that train once it has devided onto Portland, OR. 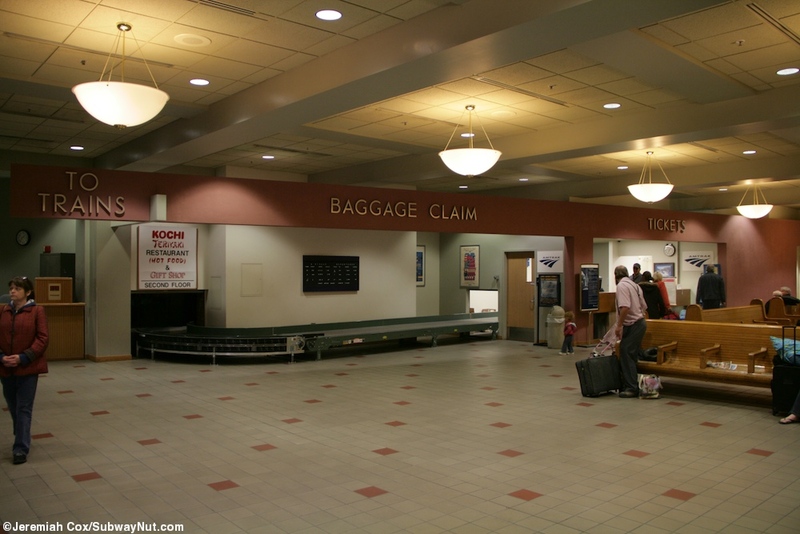 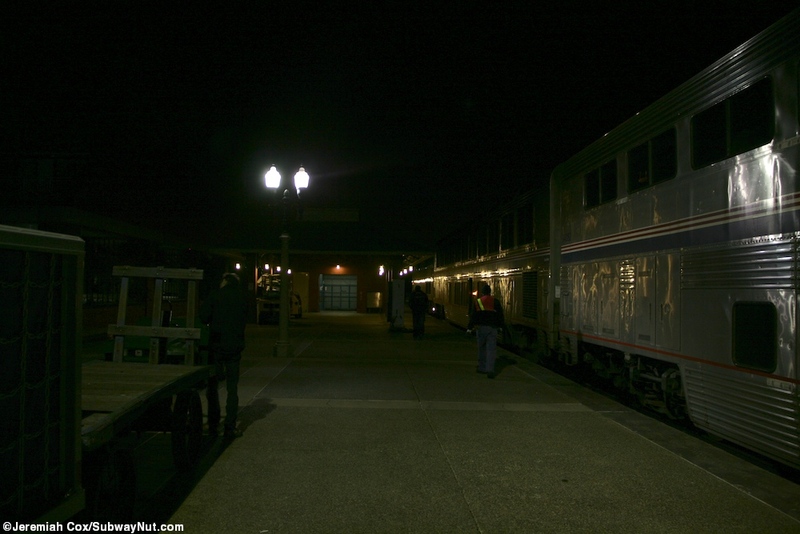 The baggage area on the opposite side of the main entrance in enclosed and canopied portion of the platform with Superliner-II Sightseer Lounge #33047.